This post will show you how to tour Lisbon on tram 28. The tram 28 brings you up and down Lisbon hills to the historic parts of the city. Most Lisbon sights are along the tram 28 route which makes tram the best way to explore Lisbon, the sunny capital of Portugal. Lisbon is the warmest capital of Europe and a perfect year-round destination. We went to Lisbon in the coldest winter and the temperature was +14 C, not bad at all. This post will show you what what winter Lisbon looks like from the tram. Instead of ruining its old pre-war trams Lisbon decided to save them. Today the trams are much loved and the city is famous them. On four of the five Lisbon tram lines (12, 15, 18, 25 and 28) old models are used and line 15 to Belem is the only line operated by where modern trams. The Lisbon public transport website is the place for general information on Lisbon trams. Here is a link to Lisbon tram timetables and routes. 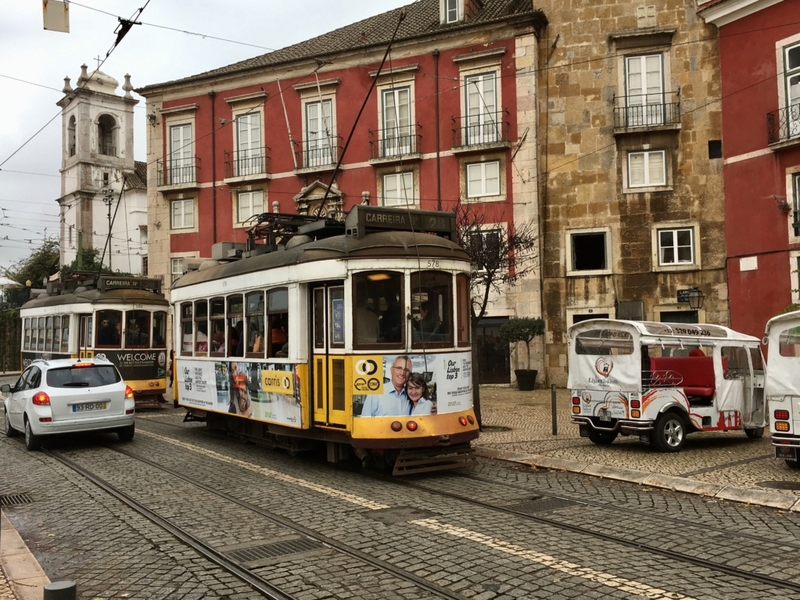 In addition Lisbon has a red tourist tram that pretty much follows the same route as the regular number 28 with the difference that the tourist tram has guidance and a higher fare. To get to the city from Lisbon airport you can simply take the metro. We examined the Metro ticket machine and of the many ticket options we took Viva Viagem electronic cards that are valid on all public transport. That was a good but not an optimal choice. Our aim was to buy day tickets that give you unlimited travel but as we traveled the tickets ran out of money in the afternoon so we had to go and top them up at metro stations. Never mind, you can live with that but I understood there should be a 24 hour option too. Of course there is the more expensive tourist card Lisboa Card that in addition to travel includes tickets to certain museums. But what was good our Viva Viagem cards were valid for Lisbon metro, trams, buses, funiculars and lifts. If you have coins in your pocket you can always pay the tram driver as well – so when paying in public transport causes problems in most cities paying is not a problem in Lisbon. I put Lisbon tram 28 on Google map. The map is based on a car route and it’s almost the same route as the trams use but there are some minor differences. Anyway, from the tracks you can always tell where the tram route is and the stops are marked with a Paragem sign. The tram’s starting point is the Square Martim Moniz in Baixa (the city centre). There are always lots of people waiting, mostly tourists. As tram 28 is popular it’s fully packed with people. Maybe you have to wait for the next tram to come, it will only take a few minutes. The tram goes north along the Avenida Almirante Reis, one of Lisbon’s busy main streets. Soon after the Intendente metro station it takes a sharp turn uphill and winds up narrow alleys. We are in Alfama, Lisbon. Tram 28 winds its way through Alfama hills. Alfama is a real labyrinth since it’s originally a Moorish city. The Moors built their tightly packed houses along winding alleys on the hillside and on the top of the hill they had a castle. Today there are no Moorish houses left but the labyrinth of narrow lanes remains. The tram driver works hard to get speed enough to get the up the hill and lows down the speed on the way down. A Lisbon tram driver in Portuguese is guarda freios, brakesman and Lisbon tram is called electrico de Lisboa. The tram makes a noise in turns and each time the driver uses the brake. At times the street is so narrow that walkers have to give way when the tram comes – and passengers can touch house walls from tram windows. What happened with the Moorish? They and the wealthy population in general left Alfama since they felt unsafe. Alfama was built in an earthquake zone and when the Moorish left Alfama became an area of workers and fishermen. Yet Alfama was not hit by the massive 1755 earthquake that destroyed central Lisbon. That’s why so many old tiled buildings still remain, some of them restored and the rest needing that. To explore the narrow lanes of Alfama you need to get off the tram and walk. Tram 28 combined with walking is the perfect way to see Alfama that due to its narrow alleys is hard to get to by car. We walked up and down the hills without a map and got lost in the labyrinth. I like Alfama! There was laundry hanging along house walls and tiled house walls could be seen in all rainbow colours. We sat in simple local tavernas and visited the 5th century castle on the top of the hill, Castelo de Sao Jorge. Many of Alfama streets are lined by azulejo houses, a building style you can only see in Portugal. They even have an azulejo museum, Museu Nacional do Azulejo. It is located in a former monastery and has a fine collection of tiles, one of which is 23 m high. Azulejo is not only used as a house surface material, it’s also used for art and decoration. Look at this peacock! This is another house wall. It has the famous Galo de Barcelos, Rooster of Barcelos, the symbol of Portugal. A legend tells that in Barcelos in north Portugal a dead rooster stood up and saved the life of an innocent pilgrim who had been sentenced to death. Since Alfama is on a hill there are miradouros, lookouts, with panoramic views of Lisbon and the river. The Tejo river is so wide that it looks more like an ocean bay than a river. These views are from the Portas do Sol miradouro and equally great views gives the Miradouro Santa Lucia next to it. Look at these tiled roofs in the lower part of Alfama. In the upper photo you can see Alfama’s main church, Igreja San Miguel. Below you can see the two-towered Sé, Lisbon’s cathedral on the border of Alfama. I was wondering why Portuguese cathedrals have such short names. It’s because they were built for bishops. They were originally called Sedes Episcopalis, the Bishop’s seat. The Sé of Lisbon was built in 1150. Since those days it has seen earthquakes after one another including the 1755 earthquake, and each time The Sé was rebuilt, and each time something new was added to the original cathedral. In front to the Sé you can take a tuk tuk if you like, there are many of them in Lisbon for the tourists. We instead were touring Lisbon on tram 28 and took the tram to the west, up to Bairro Alto on the opposite side of Baixa, the city centre lower down. In fact we went further than Bairro Alto. To get a general view of Bairro Alto we first took the tram all the way through, almost to the end stop. We hopped off at Jardim da Estrela since somebody told us it’s not worth going further than that. It was a long tram ride, first through Central Lisbon and then through the upper town, Bairro Alto. Jardim da Estrela is a botanic garden with a pretty pond and a lakeside cafe but in general there is not so much to see in parks in winter. On the other side of the road was the huge Basilica da Estrela but we took the tram 28 back and hopped off when we were back in Bairro Alto, at its lower end. At daytime and on weekdays Bairro Alto is like a quiet residential area. Bairro Alto streets were constructed in a regular pattern which makes it different from Alfama and it’s also easier to find one’s way in Bairro Alto. We strolled on the steep streets and in places it was all stairs. Some houses were well kept and others peeling. It looked like every day is a laundry day, laundry was hanging out everywhere. Bairro Alto traditionally is a working-class area but today young bohemians keep moving to the area. Streets and windows were decorated in a style that I’ve only seen in Brazil before, and some people had used their creativity in decorating their balconies. In a way Portugal is so different from all other parts of Europe. There is something in Lisbon and it’s historic quarters I really like that makes Lisbon the city it is. This is the iconic funicular that connects the upper town (Bairro Alto) with Cais do Sodre at the foot of the hill. Elevador da Bica is the smallest of Lisbon elevadores that bring people up to the hills and save their legs. The Bica line opened at the end of the 19th century. The funicular gets its power from an electric motor combined with cables in the ground. Here you can see the tracks and the cable in one of the middle tracks. The lower stop of Eleveador da Bica is in a house and the photo below shows the elevador tracks seen from the lower end. The steep side of the Bairro Alto has a lookout, the Santa Catarina Miradouro that gives views to the city and the river and if you are interested you can visit the Museu da Pharmacia next to the miradouro. In addition there is the Museu National de Arte Antiga. One more sight I could recommend is the Solar do Vinha do Porto, the Port Wine Institute where you can sample port wines. There are 200 different sorts to choose from. The other side (the less steep side) of Bairro Alto is Lisbon’s centre of nightlife. By day you wouldn’t believe it since this is an old-fashioned residential area, but when the night comes Bairro Alto transforms to a party hotspot. At nights the area is full of bars, restaurants and night clubs and of course casas de fado. Some bars and cafes are open at daytime too and so are all the small book, music, souvenir and second-hand shops. Bairro Alto has two or three pretty squares with well restored townhouses. In all, Bairro Alto is must-see area in Lisbon and tram 28 conveniently takes you there. And the same tram also takes you back to the city provided you don’t decide to stay until late night in bars and fado houses. Lisbon trams don’t have a night service. This is Baixa, the lower town and Lisbon city centre, seen from Alfama. The other photo shows Baixa from the other side, from the stairs to Bairro Alto. You can see Baixa down in the valley and Alfama and Castelo do Sao Jorge beyond it. Between Bairro Alto and Baixa is the elegant commercial hillside of Chiado. To get from Bairro Alto to Baixa you can either walk down the stairs from the square of Praca Largo do Carmo, take tram 28 or travel on a national monument, Elevador de Santa Justa. Elevador de Santa Justa is an old wrought iron lift, from 1902, grey and decorated with filigree. This old elevator takes you between Baixa and Bairro Alto. My photos show it from the lower town. To use the elevator you can buy single tickets or use your Viva Viagem card. One more way to get down from Bairro Alto is the Gloria Funicular that takes you to the square behind Lisbon train station. Elevador da Gloria looks similar to the funicular of Bica. Lisbon elevators have been declared to Portugal’s National Monuments. Elevator timetables and tickets are explained on the Lisbon Public Transport website. This is Estacao do Rossio, the well decorated Lisbon train station. The station building is from the 19th century and has Moorish horseshoes as doors. The Rossio station faces the main square of Lisbon with the same name and north of the station is one more square, Praca dos Restauradores. Another street you should see and not least at nights is the long pedestrian street Rua das Portas de Santo with its long row of restaurants. I always look inside buildings and gates and on Rua das Portas I saw this beautiful scene (see above). This is Lisbon in winter, at Christmas time. Lisbon’s busiest shopping street is the pedestrian street Rua Augusta that leads from Rossio to Praca do Comercio on the riverfront. In between is the Arco da Rua Augusta that you can see in Lisbon postcards and photos. The riverfront square Praca do Comercio was built after the earthquake 1755 and the huge wave that followed had destroyed the whole Lisbon riverfront and most of Baixa. Today the square has impressive yellow buildings on all sides, all with similar white arcades. In the middle of the square is a sculpture of Josel who was the king in 1755. On Praca do Comercio we found a beer museum and a beer house that also had a funny machine producing traditional Portuguese codfish cakes, Pastel de Bacalhau. So we tasted beer and codfish cake with cheese, the specialty of Lisbon. Very special, and good! What else is typical of Lisbon? Maybe nothing can compare to Fado. Fado is played all over Lisbon and most of all in the clubs of Alfama and Bairro Alto. It is a centuries old tradition, a melancholic song that’s accompanied by a guitar. Fado tell about feelings that are common to all people: about love, joy, sorrow but most of all about missing. Missing someone that left and went away. Maybe to the sea? Fado is a so essential part of Lisbon’s heritage that UNESCO has classified it as Cultural Heritage of Humanity. For Portuguese fado you should to to fado clubs or restaurants that have fado presentations. Also concerts in concert halls are being arranged, and if you are interested in learning more about fado you can vist the Museu do Fado. So this was an introduction to Lisbon, the capital of Portugal, as seen from tram 28. I really enjoyed visiting Lisbon, I liked the city and would like to go back one day. If you have more ideas on Lisbon, share it. Can you tell me approximately how long the trip on tram 28 is from Martim Moniz to Ourique? The timetable says it will take about 40 minutes but depending on traffic it can take up to an hour or even more. So it’s not the fastest way to get from one place to another but certainly the nicest. Thanks for asking and have a nice trip! Hi..once I hop off the tram to walk around and hop on again at another location, would it cost me much? Or is it better if I buy a Tram 28 trip that includes walking around? I would say it’s far much cheaper to use regular tickets than buying a tour, even if you hop off where you want and pay again when needed. Have a nice trip! I’ll be arriving in Lisbon by ship and want to sightsee on Tram 28. What stop would be closest to the port? I guess the closest stop might be the Rua das Escolas Gerais stop. You just walk uphill from the port, to Alfama. It’s less than a kilometer. Have a great day in Lisbon!